Few Star Wars fans need an introduction to Dan Wallace. Over the course of two decades, Dan has been one of the undisputed kings of worldbuilding, lore, and back history for the Galaxy Far, Far Away. In the old Expanded Universe, Dan’s Essential Guides were truly essential reading for fans who longed to know more about the characters, species, and worlds of the Star Wars universe. This trend continues in the new canon, with the book Star Wars: On The Front Lines. 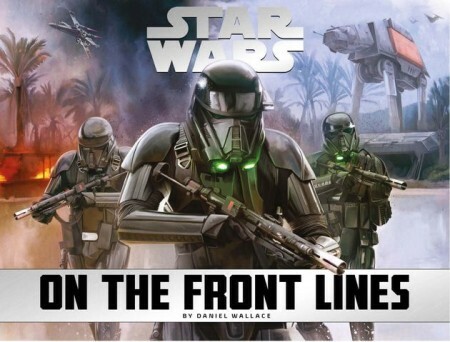 Released this past week in the US, On The Front Lines is an up close and personal look at the major battles that defined the Clone Wars, Galactic Civil War, and the new war between the First Order and the Resistance. Dan was kind enough to take some time to discuss this book and one of his upcoming works, Journey to The Last Jedi: The Rebel Files. Without further ado, let’s get into the interview! First off, thank you for your time, Dan! This is your first foray back into traditional guidebooks for Star Wars in a few years, correct? What was the main driver behind this guide and what was the development process like? Yes, this is the first Star Wars reference book I’ve worked on since Ultimate Star Wars in 2015. But I’d done many reference books before then, everything from kid-friendly warfare guides like Star Wars: Battles for the Galaxy to dense, lore-heavy tomes like The Essential Atlas. So writing this was like putting on a comfortable pair of boots. I started talking about On The Front Lines back in 2015 with Delia Greve, my editor at becker&mayer. The idea was essentially for a hardcover art book about famous battles, in the vein of WWII or Civil War retrospectives. To get our heads around the idea we focused on the Battle of Hoth—with its trench warfare and front-line soldiers and mechanized combat—and envisioned a double-page painting to anchor the section that would depict an angle we had never seen before. For inspiration, I looked at real-world books and famous paintings depicting the Battle of Gettysburg, the Battle of Trafalgar, etc. From there I knew we wanted the text to be in service to the imagery—this would be primarily an art book—and I also knew I wanted to minimize recapping things we already know. So there’s new information in this book, including context about the causes of each battle and the fallout that came after. My favorite is the “I Was There” sidebar, which is a first-person narrative from a battle survivor. Because the book focuses on front line combat, I de-emphasized the role of movie heroes when recounting the battles. Lando only shows up in the context of Gold Leader from the Battle of Endor; Luke only shows up as Red Five. It’s great that you intentionally de-emphasize the movie leads and shine the spotlight on lesser characters. As a big fan of a certain supporting character myself, I’ve always appreciated that about your past works. Which supporting characters have you enjoyed fleshing out the most over the years and why? You’re right that fleshing out minor characters can be one of the most rewarding parts of a project like this. Most of my books tend to be non-fiction, in which the organization and presentation of facts is Job 1. But at the same time there’s usually a chance to inject some personality into the data. I think it makes the whole thing more compelling, and more human. There’s a bunch of that in On The Front Lines, because the main characters from the movies often aren’t the same people fighting on the front lines. If they’re seen at all they’re movie extras with no lines. But in this book they’re an Echo Base trooper trying to take down an AT-ST, and an A-wing pilot shot down over Jakku who makes her last moments count for something. My favorites were the oddballs. Musmuris Reetgeet is a weird Ranat salvager active at Jakku. Oma Prumba is a Gungan conscript who recounts her memories of the battle using Gungan dialect. What process went into selecting the specific battles highlighted in this book? Every major Star Wars project involves a major set-piece battle, so when outlining the book it made sense to include the movies in chronological order: Naboo, Geonosis, Coruscant, Yavin, Hoth, and Endor, plus Starkiller Base even though The Force Awakens wasn’t out yet at the time. From there, we went back-and-forth to fill in the holes. Rogue One received an early placeholder spot; it was over a year before we were able to nail it down as Scarif. From the Clone Wars series we included Christophsis—the opening battle in the Clone Wars theatrical movie—and ultimately decided to go with Ryloth over Malastare. We gave our last spot to the Battle of Jakku, knowing it would help bridge the gap between Return of the Jedi and the new films. Your telling of the Battle of Jakku is the first definitive source that has incorporated and made sense of the snippets we’ve seen in other media, namely Lost Stars, Empire’s End, Blade Squadron: Jakku, and Battlefront. How did you approach plotting out the final climactic battle of the Galactic Civil War and what are the challenges you face when trying to piece multiple sources together? The Battle of Jakku was an interesting one, given the staggered way in which the puzzle pieces showed up. I completed a very different version of Jakku nearly a year ago, back when the only big sources were Lost Stars and the Battlefront game. I did my best to piece together an overall chronology for the battle while figuring out the major players. But then came Empire’s End, which approached Jakku in a different light and incorporated the characters from the Aftermath trilogy. And the material was great. I went back and rewrote my Jakku entry, using Chuck Wendig’s notes and outline as reference since the Empire’s End manuscript wasn’t available yet. This ended up improving the scope and coherence of the battle quite a bit. Jakku is the only battle in On The Front Lines that, as viewers, we’ve never seen play out in front of us. I think that makes it one of the more interesting ones. In the past year, we’ve seen several other major battles added to the canon, namely the Battle of Atollon from Star Wars Rebels and the massive Battle of Kuat from Life Debt. If you could magically add more battles to this book, which ones would you add and why? I feel like we could do a lot more with The Clone Wars. The Battle of Malastare was narrowly excluded from the book, and there are at least a half-dozen other battles from that era that would make for great content. The two battles you suggested are great candidates as well, since they help plug holes in the timeline. In the new canon there’s still a long gap after Episode III and again after Episode VI. In time those periods will get filled in with new projects, but right now the historian in me is intrigued by the dates of Atollon and Kuat, for how those battles could have shaped galactic events. One of the fun aspects of this book was your focus on the various commanders on each side of these battles. What qualities do you think the best of these leaders embrace? Do you have any favorites among the characters profiled in this book? In real-world chronicles of historic battles there’s always a big focus on the commanders: how evenly General Sherman and General Lee are matched, or how their leadership qualities and blind spots play out via the movement of their troops on the battlefield. On The Front Lines always has profiles of the opposing commanders for each battle, and they’re not always who you remember. It was General Ceel who really called the shots on Naboo, not General Binks. I enjoyed profiling the various commanders, and the accompanying portrait art of each character is absolutely stunning. My favorite part was the chance to create “new” faces who clearly must have been there all along, like Honor Salima, the Naval Commander of Coruscant’s Home Defense Force. The death of Hobbie at the Battle of Hoth caught a lot of fans of the old Expanded Universe by surprise. Can you explain the thought process behind this decision? Yeah. Hobbie, AKA snowspeeder pilot Rogue Four from The Empire Strikes Back, is the subject of the “in memoriam” feature for the Battle of Hoth, which we called “Tales of Valor.” For fans of the old Expanded Universe, Hobbie was one of the stars of the X-Wing book series which took place long after the Battle of Hoth, so obviously Hobbie must have survived the battle. I love that Hobbie. He has a great rapport with Wedge and is basically the glue that keeps Rogue Squadron together. But there’s another bit of Hobbie lore, which is that the character was originally scripted to die in The Empire Strikes Back by crashing his snowspeeder into the head of the lead AT-AT. This scene survives in the script and was drawn up as an animatic sequence, and on YouTube you can find the footage that was filmed of the AT-AT cockpit crew throwing their arms up in terror before the impact. Back in October 2015, when we were still finalizing the outline, Hobbie’s death was brought up by the Lucasfilm Story Group during a round of notes. They pointed to the cut scene from Empire, and I subsequently revised the outline to give Hobbie an appropriate “medal of honor” sendoff. My understanding at the time was that under the new canon, the cut scene from Empire took precedence over the Legends novels. Because On The Front Lines might be the first Star Wars source to make Hobbie’s death explicit, I want to point out that in no way is this a case of “killing off Hobbie in a reference book.” My interpretation of Lucasfilm’s stance—and note that I’m in no way qualified to speak for the Story Group, so apply all available disclaimers here—is that Hobbie was ALREADY killed off in Empire, so reference books need to reflect that fact moving forward. In the new canon, major character deaths don’t happen without a major story behind them. My little reference book is NOT that story. Empire is that story. But I’m still sorry about Hobbie. You and your colleague/collaborator Jason Fry have probably written more about warfare in the GFFA than any other authors, The Essential Atlas being one of the first to try and tie together a narrative for the EU’s telling of the Galactic Civil War. In the new canon, the war between the remnants of the Empire and the rising New Republic ended in a year; do you have any thoughts or observations on the different angles taken between old and new canon? I don’t think it’s fair to compare how old and new canon measure up to each other regarding the complexity of the Galactic Civil War, at least not yet. The old EU had decades to draw on a blank slate, and some of the things that got laid down—the ending of the Thrawn trilogy versus the beginning of Dark Empire, for instance—didn’t seem to work at all. But over time we saw the evolution of that history, how the fall of Coruscant and the collapse of the Empire into factions began to make sense as more and more narrative was added to the pile. Because I Worked on the Essential Chronology books I felt I had a front-row seat on all of that. The new canon doesn’t yet have that decades-long narrative sweep of ebb and flow. But it will, I’m sure, and the construction is going to be a lot tighter. Switching gears, your next big work is Journey to The Last Jedi: The Rebel Files. For fans unfamiliar with this book, can you explain the concept behind it and what sorts of interesting things we’ll find in it? If anyone is familiar with The Jedi Path—or Book of Sith, The Bounty Hunter Code, or The Imperial Handbook—then they already have a general sense of what kind of project this is. Unlike those earlier titles, Rebel Files is about the birth and evolution of the Rebel Alliance. And, due to the timing, this is the first one that’s part of the new canon and not Legends. The idea behind Rebel Files was to create an in-universe artifact that is also an in-universe fictional narrative. The Deluxe Edition that’s coming out this fall really plays up the artifact aspect, coming inside a special light-and-sound case that projects the Death Star schematics when you hit a button. Inside you’ll find the Rebel Files book, which is designed to appear as if it were a repository for significant historical documents that chronicle the history of the Rebel Alliance. So that means you’ll find entries from Mon Mothma’s personal diary, pages torn from Rebel combat manuals, and IM-style communications between Mon Mothma and her closest aide. The book has a scrapbooky feel, but the documents were assembled in a specific way so that they could convey an overarching narrative concerning the existence of the Alliance and the lives of a few specific people. I really like it, and I hope readers do too. Your books have covered everything from galactic cartography to characters to battles, with tons in-between. Any dream projects you’d love to tackle? I’m really grateful for the work I’ve been able to do in the Star Wars universe, and I’m happy that my projects align with my skill set. Books like On The Front Lines or Rebel Files are really a mix of media styles: narrator omniscience, history-book authority, first-person unreliable memories, in-universe factional “fake news” bias, etc. This is exciting stuff to write, and hopefully interesting to read too. Thanks again for your time Dan! We look forward to chatting with you again in a few months when The Rebel Files is released. Dan Wallace is always such a treat. I’ve been waiting for an Essential Guide-esque reference book to drop in the new canon; wasn’t aware this one was coming, but it looks like just the sort of thing I’ve been hoping for.